It all looked so professional. The healer had a clean-cut face; he wore neat clothes; and lived in a decent house on the outskirts of Matagalpa. But once Pedro saw the bottle with the murky potion, which he had to drink entirely, he started to have doubts. There was a little statue of Christ, looking down on them. Pedro asked what was in the bottle. “A herbal mix with frogspawn,” the healer said. That was what the evil spirit would attach itself to, he explained. The laxatives on the following day would flush the spirit away. The next day, they looked at Pedro’s diarrhea. But Pedro was not healthy. The chaos in his mind persevered, sometimes so overwhelmingly he lost track of time and reality. Pedro has known embarrassing moments: raving through the streets. Luckily, they are moments he does not recall thoroughly today. And they’re now in the past because he takes the right anti-psychotic drugs. Pedro’s story is one of many in Nicaragua. The belief that natural healers and witchdoctors can cure a mental illness like psychosis is all too common here. For that reason, an organization called Cuenta Conmigo (You can count on me) was founded in Matagalpa. It seeks to inform people about psychotic disorders. The organization is now completely run by family members of patients. Pedro – which is not his real name – had his first psychotic episode during Nicaragua’s civil war in the 1980s. It happened when he was a soldier in the mountains near his hometown Matagalpa, but he doesn’t recall the exact date or what he was doing there. After a bomb exploded, he was taken to a hospital and there they realized he had lost his mind and gave him anti-psychotics. His parents, however, believed evil spirits were causing the chaos in his mind: he had to go to a healer. At first he didn’t want to go, but after a relapse years later, they sent Pedro to the man with the frogspawn. 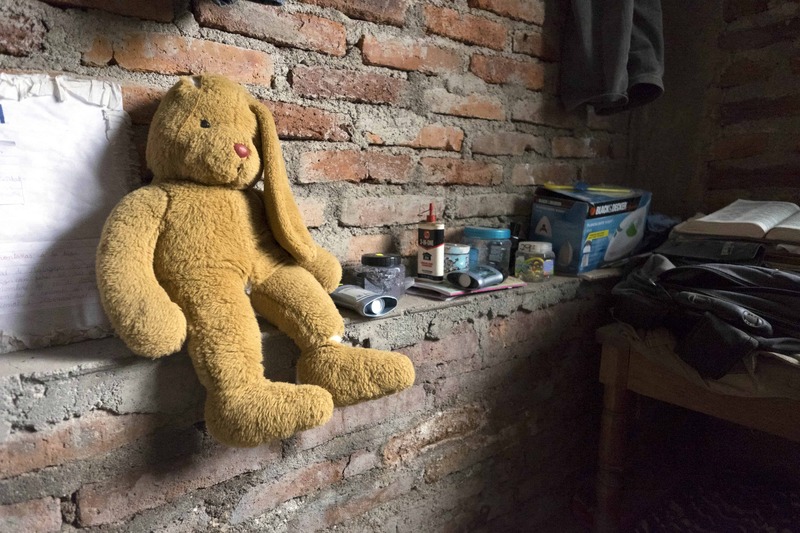 “The problem in this country is mainly the lack of information regarding psychosis,” Rosalba Gurdián said in the office of Cuenta Conmigo, which she founded with the Dutch psychiatric nurse and anthropologist Rimke van der Geest. Many of the patients, and their family members who visit the organization, don’t immediately share information about where they’ve gone before for treatment. They are ashamed. However, usually as trust builds, they’ll spill that they’ve visited witchdoctors or natural healers. “It is easier to believe in a bad spirit than to accept that you are dealing with a mental illness which will never go away,” Gurdián said. For a treatment, a witchdoctor might charge up to $200, equivalent to two months’ salary for Nicaragua’s poorest citizens. It’s profitable to make patients believe they’re possessed. Spanish citizen Angela Guiu, who runs a shop with herbs and natural medicines in Matagalpa, often hears about these witchdoctors from her clients. A woman came to Guiu because she was told she had hair in her liver. Even leaders of the local Catholic Church who believe in exorcism often send patients to a psychiatrist first. “Schizophrenia often has a very clear material cause,” said Friar Gregorio, a member of the Franciscan order in Matagalpa. He said exorcism could be needed in addition to psychiatric treatment because the “disorder could be used by an evil spirit to gain access to someone’s soul.” But he distanced the church’s version of exorcism from that performed by witch doctors. Cuenta Conmigo still regularly receives people whose psychosis has been untreated. The patients are sent directly to a psychiatrist, after which an arduous process of recovery follows. Since he got into treatment, Pedro’s condition has stabilized. His mother died a year ago, and with her, discussions about demons and bad spirits. Now Pedro concentrates on taking care of his 12-year-old daughter, and hopes she doesn’t remember the days when he shouted and raved through the streets because of his psychosis.